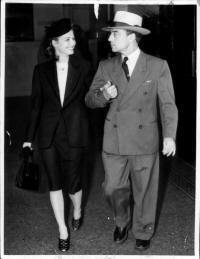 En route from Los Angeles to Massachusetts, in June of 1949 Buster Keaton returned to Muskegon with his bride, the former Eleanor Norris, a dancer in various movies. The couple married in 1940. 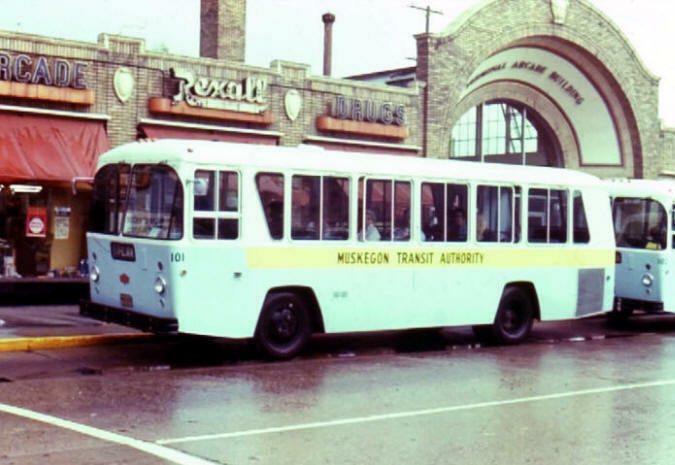 "When he knew he was to go to the East, Buster planned his trip so that he would have at least two days in Muskegon," noted a June 9, 1949 article in the Muskegon Chronicle. "The Keaton's left California five days ago and drove here in easy stages. When he finally reached here, he was amazed at Muskegon. 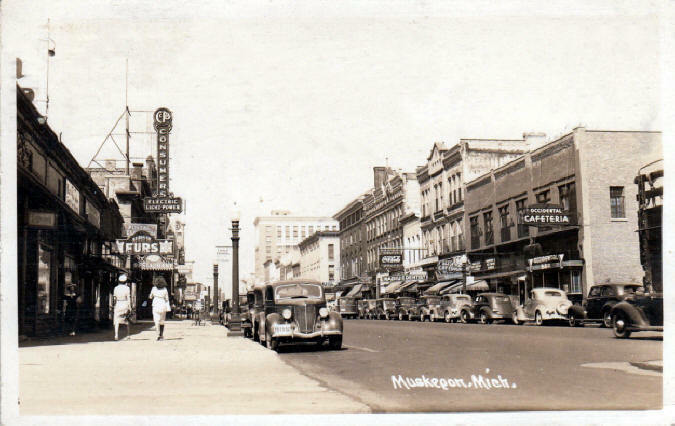 Except for one day here in 1919, following his discharge from the army, and a flying trip here in 1933, he hasn't seen Muskegon since that last summer he spent here in 1916. 'I thought I was in the wrong place,' he said. 'One way streets with traffic lights had me confused. 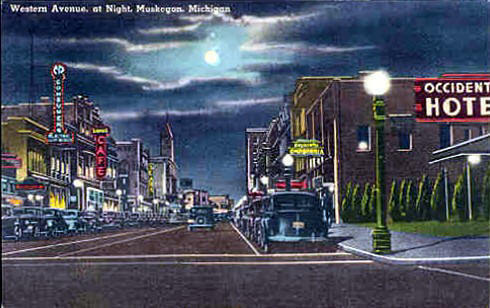 Back 35 years ago there wasn't much traffic in Muskegon and there were only a few policemen and I knew them all. Now there is traffic all over and everwhere I look there's a policeman.'" Muskegon's Downtown Harbor. In the distance one can spot the Continental Motors plant. Off to the right is the Occidental Hotel. In the foreground is the old docks for the Goodrich Steamship line, now known as the Mart Docks. from Seventh St. to Market St. 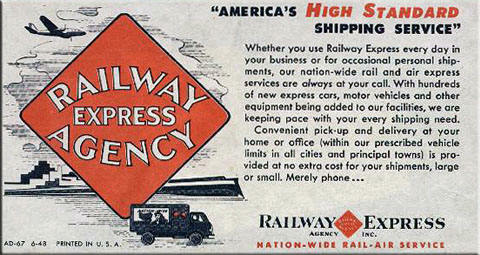 The Railway Express Agency, at Western Avenue and Market sat between Union Station and the Amazon Knitting Mill building. from Sixth St. to Fifth St.
Lake View Hotel & Nite Club and the neighboring L & M Cafe. 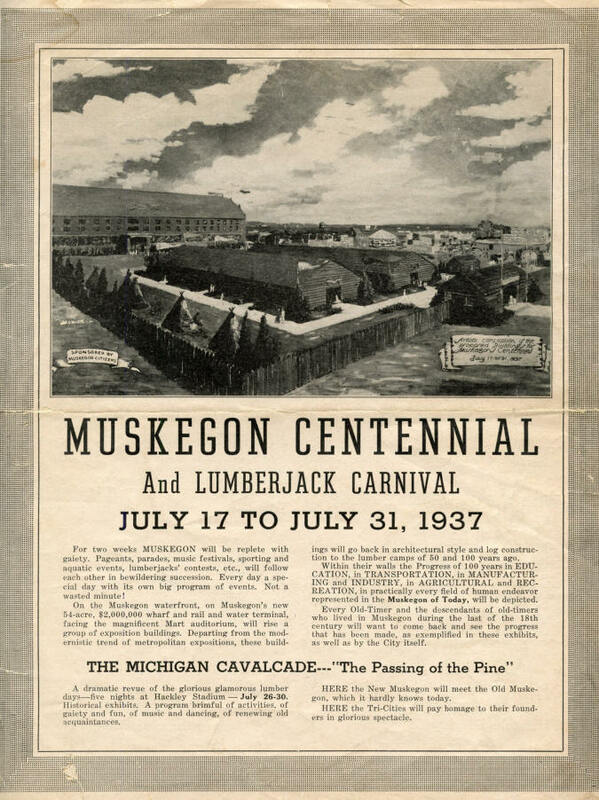 Following the collapse of Muskegon's lumber industry in the 1890s, numerous city leaders and the city's Chamber of Commerce used financial incentives to lure new and diversified business to town. 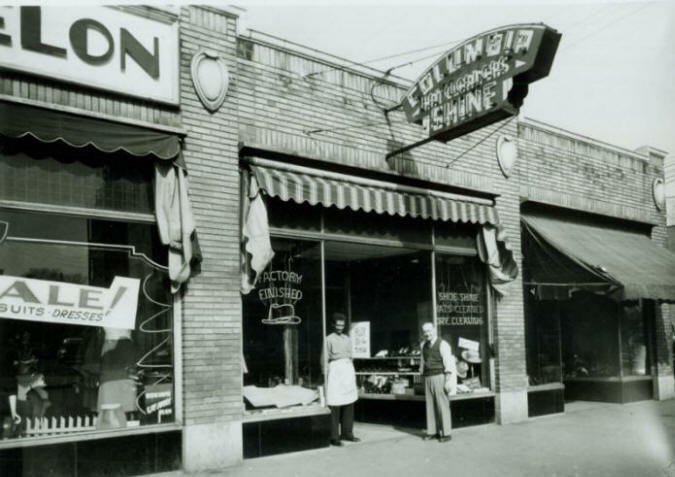 Among the early successes was the Amazon Hosiery Company of Michigan City, Indiana. 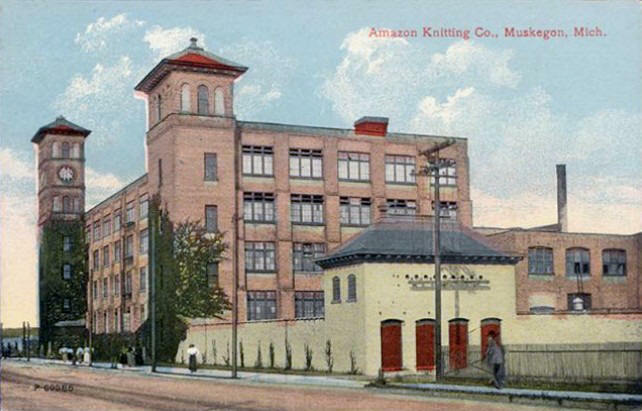 Relocated in 1895, the company, later known as the Amazon Knitting Mill, built a mill on Western Avenue near the waterfront. Designed by Chicago architect Henry Ives Cobb, initial construction on the five story building, much of which still dominates the landscape today, began in July 1895. 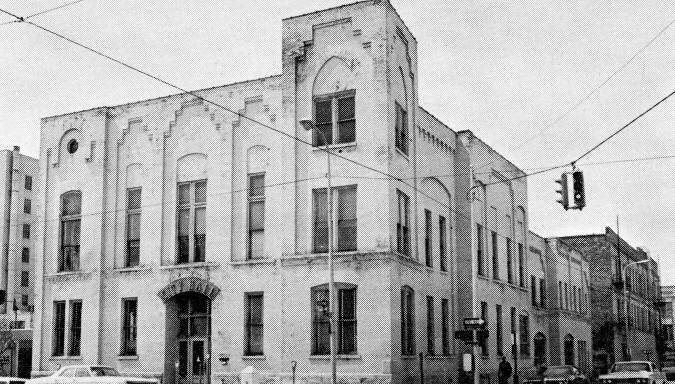 It was expanded again in 1899 and at various times during the industrial boom that took place in Muskegon along the shore of Muskegon Lake. 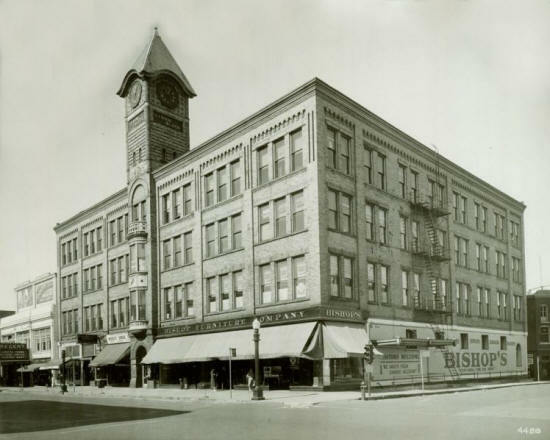 An August 1920 Muskegon Chronicle article stated Frank E. Hathaway Inc. was "engaged in the construction of its immense new garage building" at 201-203 Western Avenue and Fifth Street, across from the Amazon Knitting Mill building. It was described as one of the largest and best equipped garages in the state. 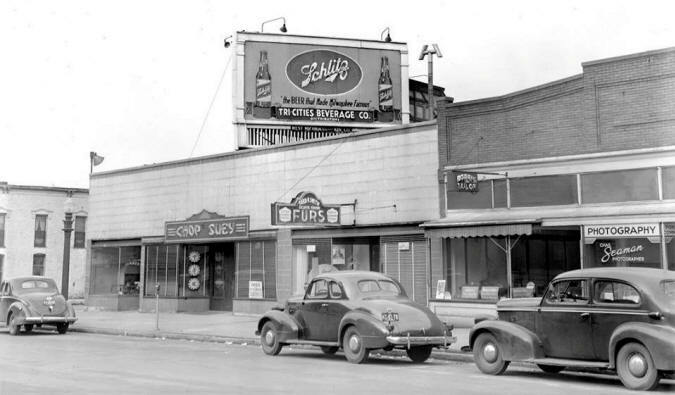 Local residents might recall it as the home of Hooper Brothers Chevrolet, occupants of the building from the 1940's until the early 1960s. 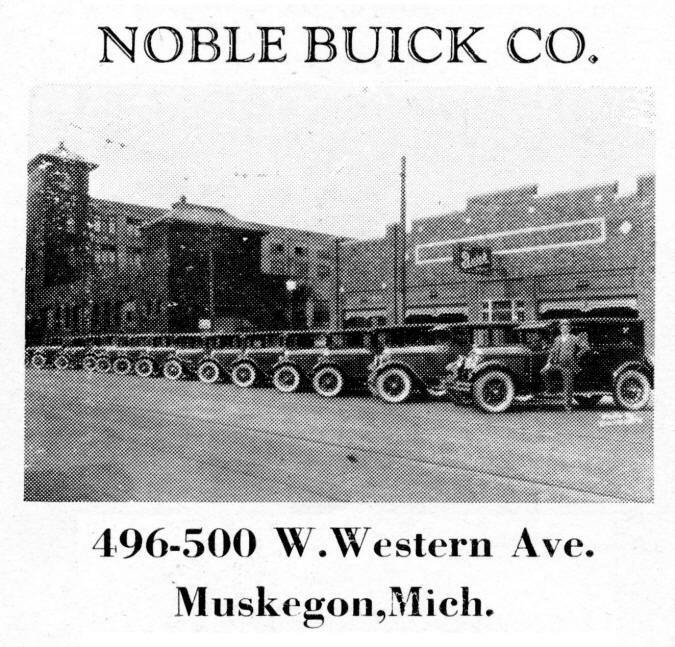 Fifth St. to Fourth St.
A 1927 image of Noble Buick, a second automobile dealership on West Western Ave. 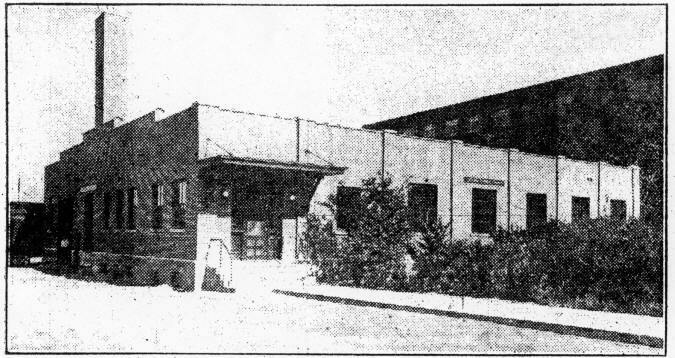 The offices of Safety Motor Coach Lines located behind Noble Buick on Thayer Street in 1926. 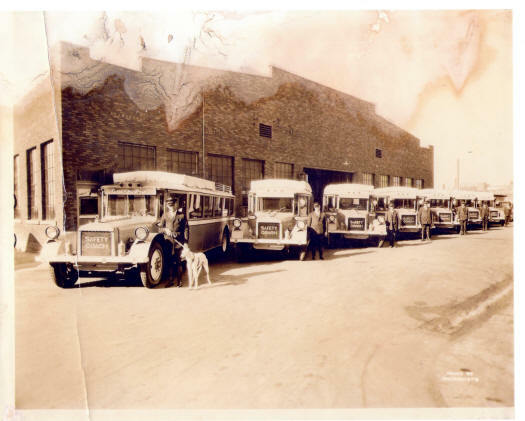 The buses were also known as "The Greyhounds." 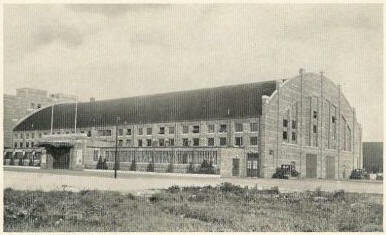 The building would later serve as a grocery store, then as an annex to the local sports arena. 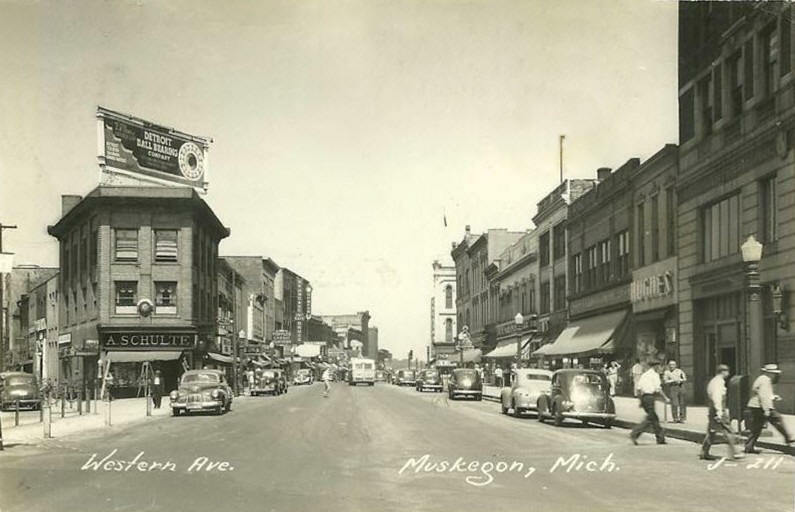 Downtown Muskegon in 1928, looking west on Western Avenue from Fourth Street. "Of special interest to the general public, the cavernous interior would be equipped with piping for manufacturing an artivicial ice surface," wrote Marc Okkonen in the Nov/Dec 1991 issue of Lake Michigan Coast magazine. 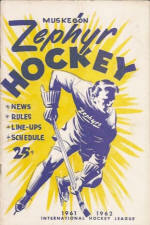 "The seating capacity for hockey and other ice events was 1,800, while over 4,000 could be accomodated for trade shows, conventions and boxing." 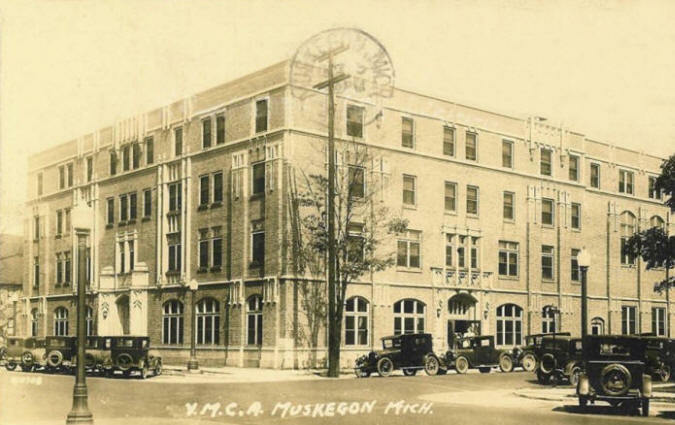 The building would serve as home for Muskegon's earliest hockey franchises, including the Muskegon Reds and the Muskegon Sailors of the Michigan-Ontario League. 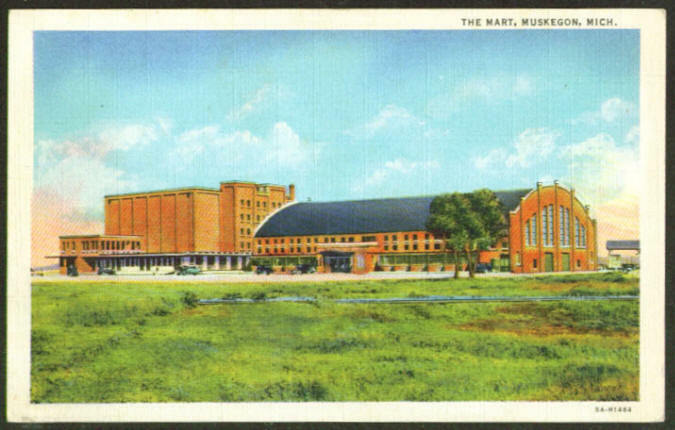 In October of 1937, "The Mart" served as the pre-season training facility for the Chicago Blackhawks. New demand for warehousing combined with economic pressures prompted the West Michigan Dock and Market Corporation, owners of the building, to convert the facility to a cold-storage unit. It would take 18 years for the city to come up with a true replacement for the complex. 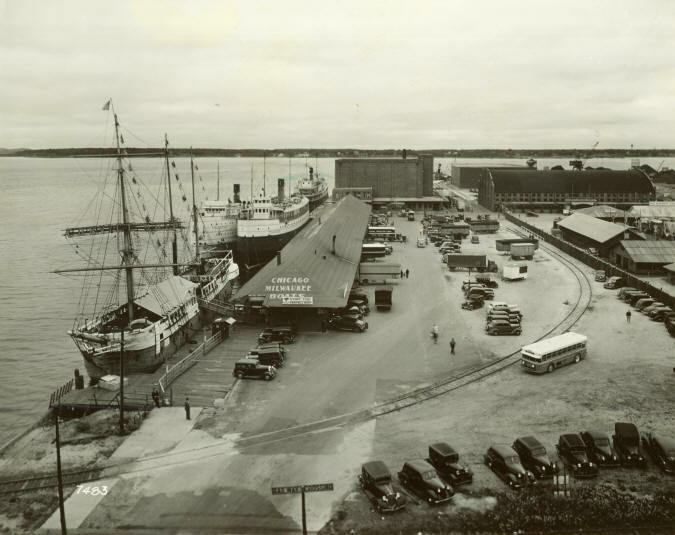 Activity at the Mart Dock during the 1937 celebration of Muskegon's Centennial. Note the ship at the lower far left in the photo. Built of teak in 1840, it is the Success, a former Australian prison ship. Used as a tourist attraction since 1890, the ship toured the Great Lakes extensively in the 1920s and 1930s, including a featured stop at the Chicago World Fair in 1933. 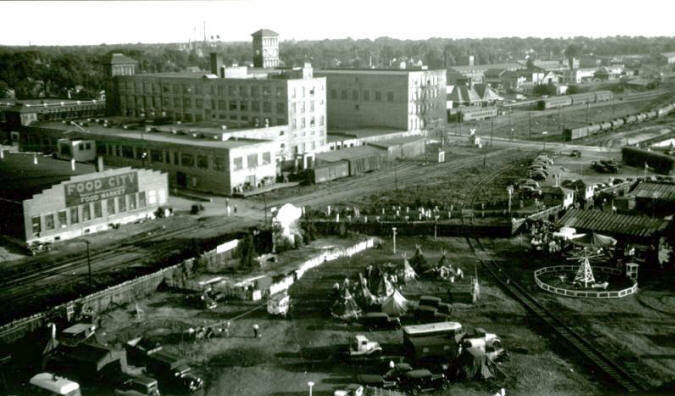 A photo looking south from West Michigan Dock and Market Corporation property, taken during the Muskegon Centennial celebration in 1937. The back side of the Union Station and Amazon Knitting Mill buildings can be seen, as well as a downtown grocery store, Food City Food Market. In 1959, construction begins on the L.C. 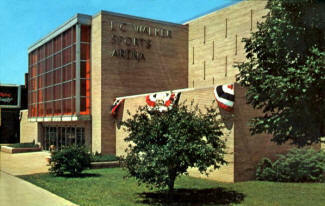 Walker Sports Arena just south of The Mart. 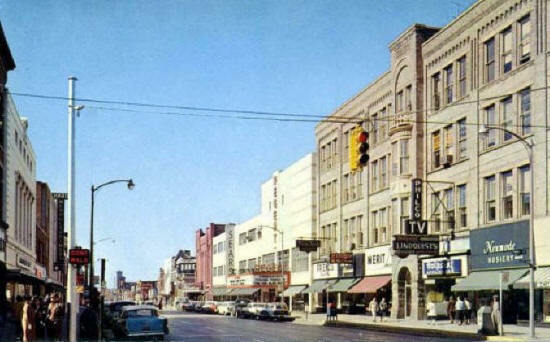 Placed on the corner of Western Ave and Fourth Street, the modern structure was designed by Ralph Legeman and Associates of Evansville, Indiana. 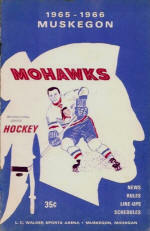 Considered specialists in the field, they had "planned 22 other arenas and school gymnasium in the Middle West." 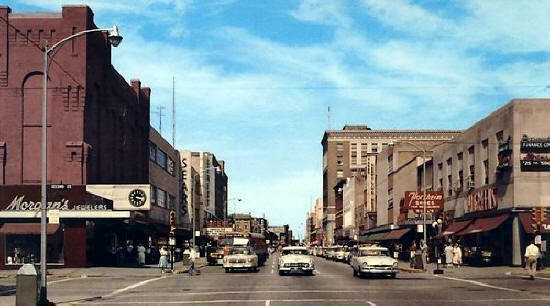 The Food City building shown in an earlier photo was a Plumbs Super Market and can be seen in the center of this photo. It would later be annexed to the arena. 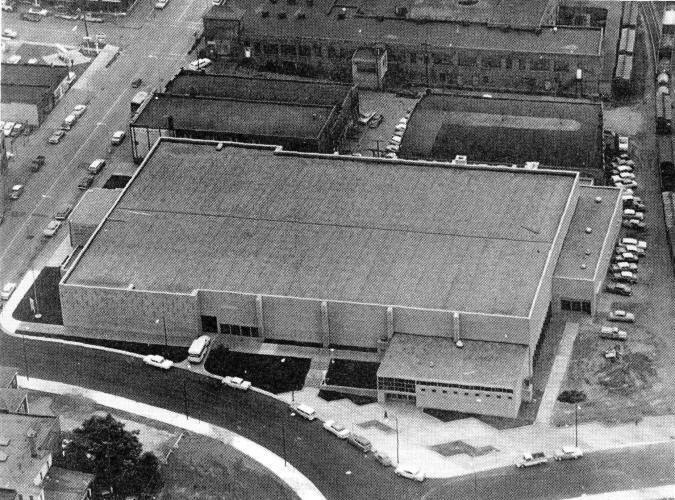 Build on the corner of Western and Fourth Street, Muskegon's new sports arena replaced the old Mart Auditorium, which had closed its doors to the public in 1942. Current Vice President and Presidential candidate Richard M. Nixon presented the official dedication speech. 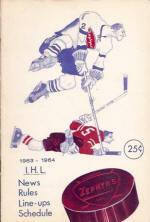 Added to the landscape in October 1960, the L.C. 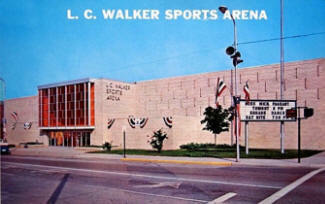 Walker Arena brought a a franchise in the International Hockey League to Muskegon. 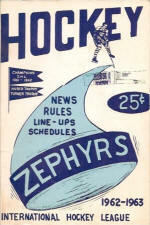 Original called the Zephyrs - a reference to to a local business, the Zephyr Petroleum Company, they would be later be renamed the Mohawks. 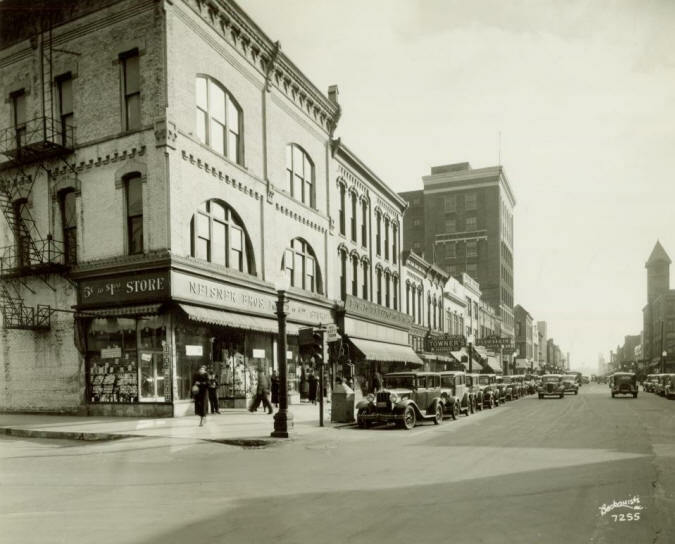 Fourth St. to Third St.
Shows the W.J. Brinen Lumber Co. offices and the Brinen Block. Corner of 4th and Western. 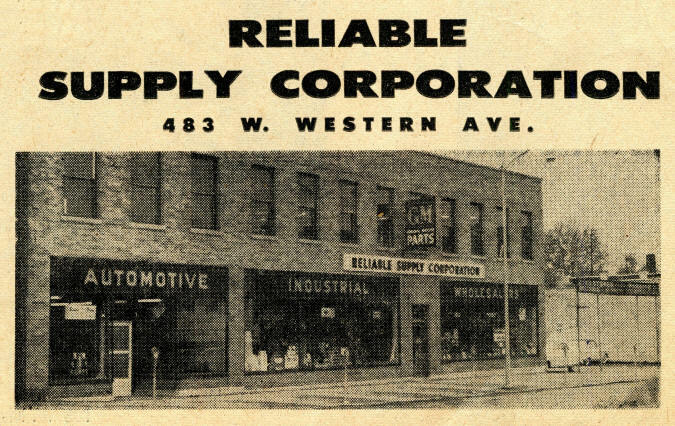 Original home of Ginman Tire. The Michigan Bowling Center. The location served a test site for new Brunswick equipment. Lakos - The place for steaks. Originally A section of the brick Brinen Block building was removed to expand this popular restaurant. 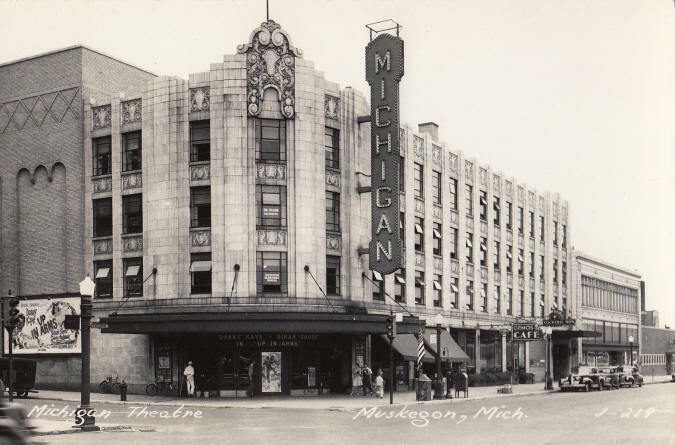 A 1944 photo of the stunning Michigan Theater. Restored to it's former glory, today it is known as the Frauenthal Theater. Each October, the theater plays host to the Buster Keaton Film Festival. 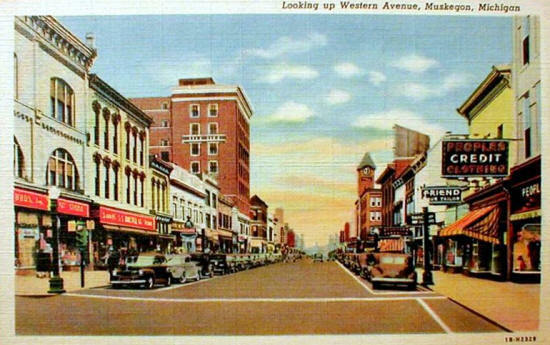 The corner of the Michigan Theater can be seen at the lower right of this birds-eye view of the Muskegon downtown area. 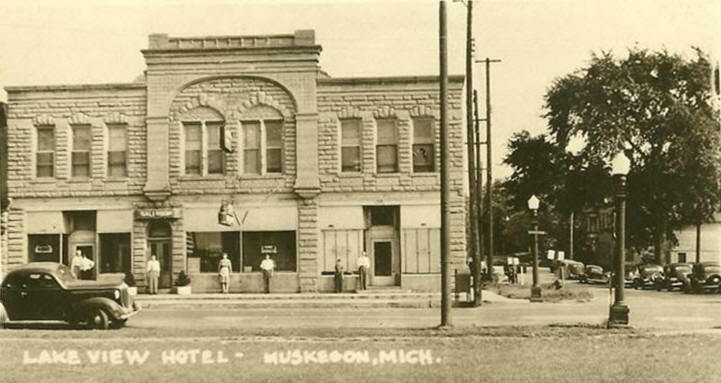 Third St. to Second St.
Muskegon's premier hotel, the Occidental first opened its doors for business in 1868. For the next 100 years, the structure would undergo numerous alterations, reconfigurations and reconstructions. Ultimately, the structure would run the length of Third St to Clay Avenue and stretch skyward eight stories. 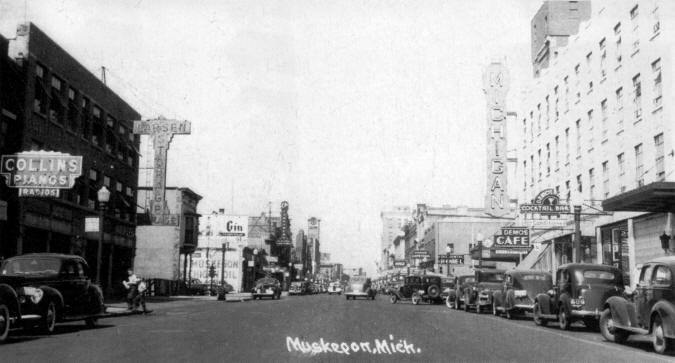 In March 1936, a spectacular fire broke out and destroyed the older front section on Western Ave," notes historian Marc Okkonen in his book, Muskegon Stories, "but no guests were harmed." The Occidental rebounded quickly with new frontage improvements made in addition to the repairs to the fire-damaged floors," notes Okkonen. 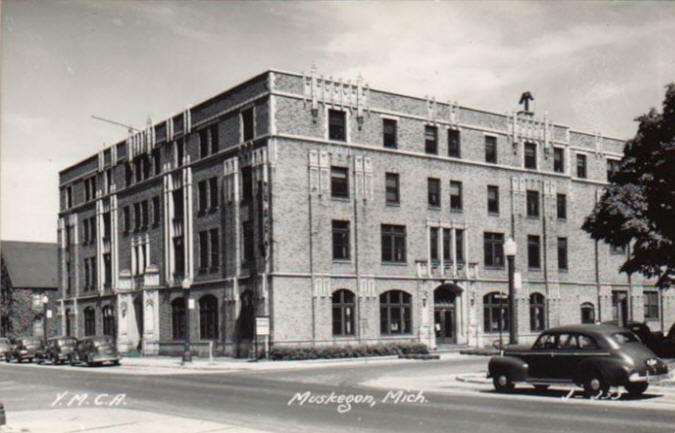 "By this time, the Occidental was THE hotel in Muskegon and became the focal point of downtown activity during the forties and fifties." 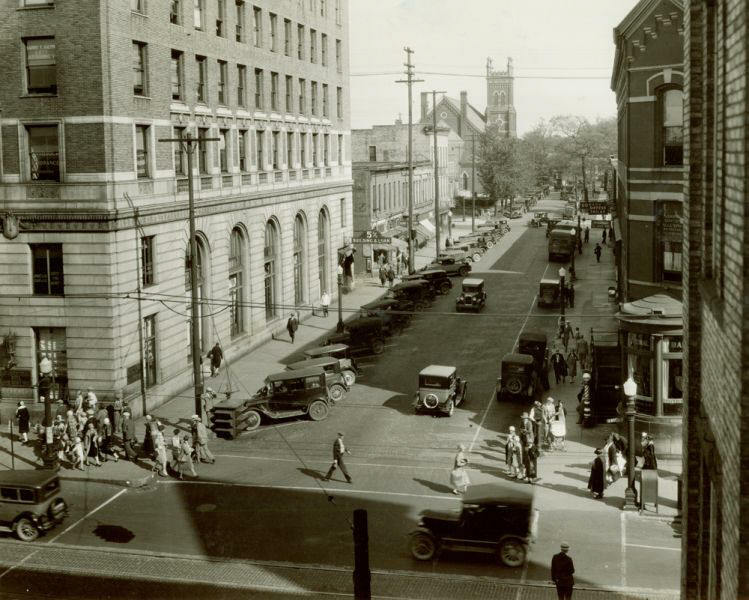 This image from 1920 shows the expansion of the Occidental along Third Street to Clay. 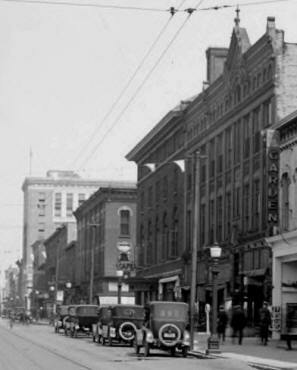 The postcad view of the grand structure would often show the hotel as viewed along Third St. and Clay Ave. 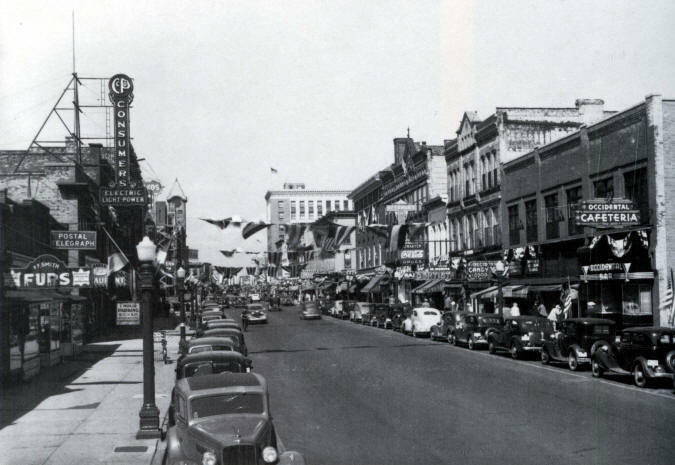 This 1937 Centennial Parade image by Beckquist's provides a nice overview of the north side of Western Avenue. 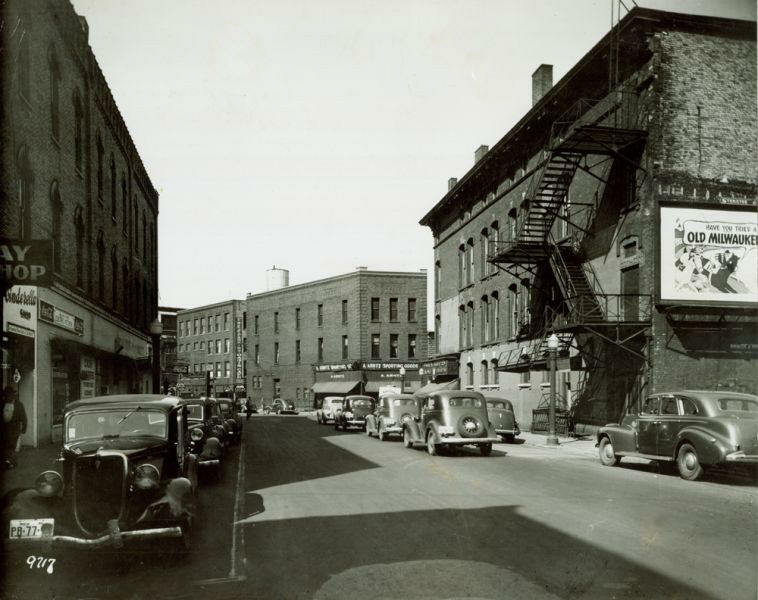 Western at Third St across from the Occidental as shown in 1944. This building would later be remodeled and house Drelles Restaurant and Cocktail Bar. 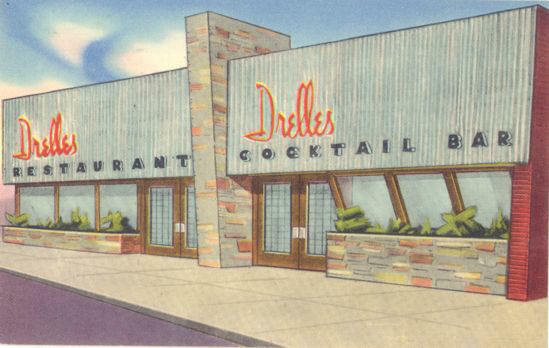 115%;">Drelles - originally operating on Jefferson St - opened at 388 W. Western Ave in September 1951, across from the Occidental Hotel. It was lost to a fire in January 1963. 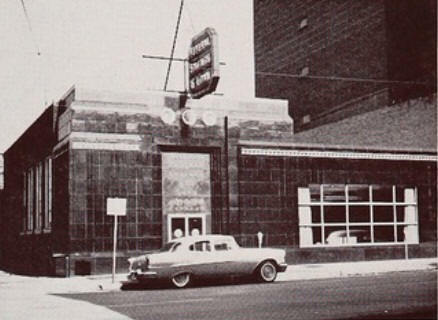 Drelles - originally operating on Jefferson St - opened at 388 W. Western Ave in September 1951, across from the Occidental Hotel. It was lost to a fire in January 1963. The postcard image shown to the left appears to an alteration of the photo shown above, with the two women walking away modified to show one walking toward the camera. 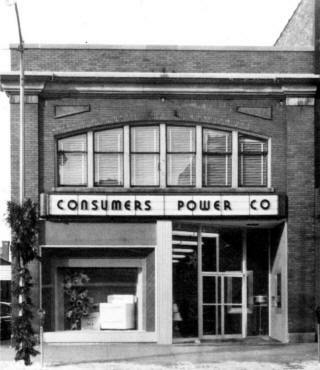 Consumers Power Co in later years. The Garden Theater on the south side of Western Avenue. 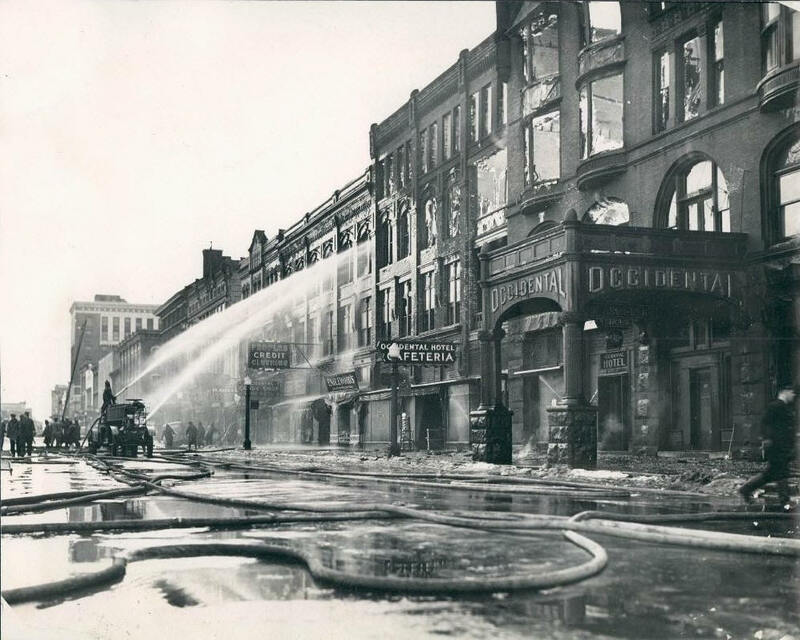 Second St. to First St.
On February 22, 1946 a spectacular fire consumed two thirds of the storefronts on the south side of the Western Ave. from the corner of Second St. eastward toward First. Again, Okkonen's book, Muskegon Stories provides the detail. 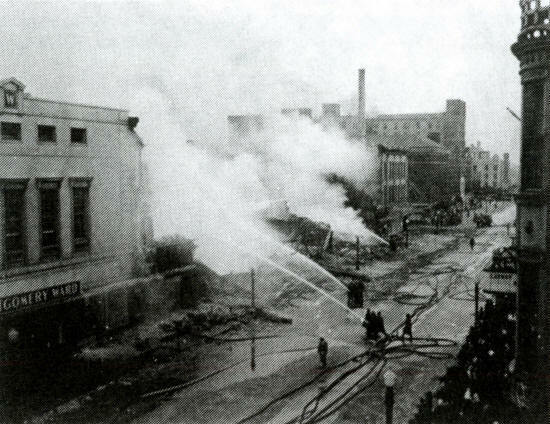 "The fire itself originated in the basement of the Hardy store when papers in a storage bin ignited for undetermined reasons and flame quickly shot up to the upper floors in the rear of the building." Fortunately, no one was seriously injured during the blaze. 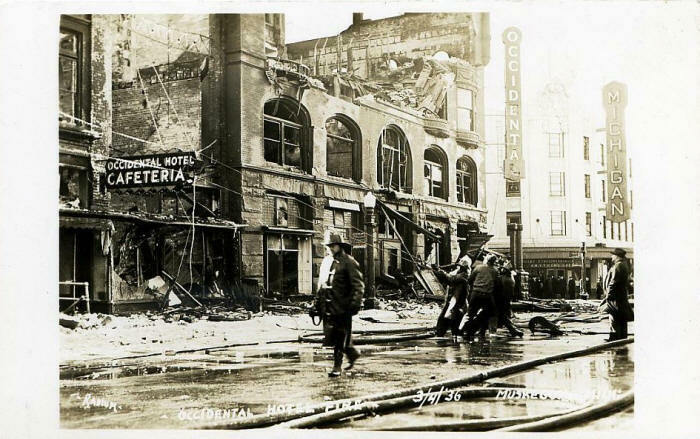 However, a number of the buildings were lost, affecting a number of businesses, including Walgreen's Drugs, Buel Shoes, Krautheim Jewelers, Mangel's, a women's clothing store, Wright Jewelers, The W. D. Hardy store, Neumode hosiery and the Daniels Company, an office supply store. Prior to the fire, "the W.D. 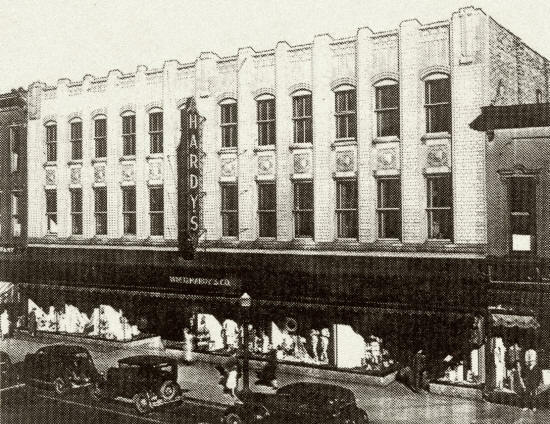 Hardy company had already announced plans for a new store to be built on Clay Avenue," Wrote Okkonen, "and the destruction of their outdated Western Avenue facility simply allowed them to relocate the planned store on the site of the old one." 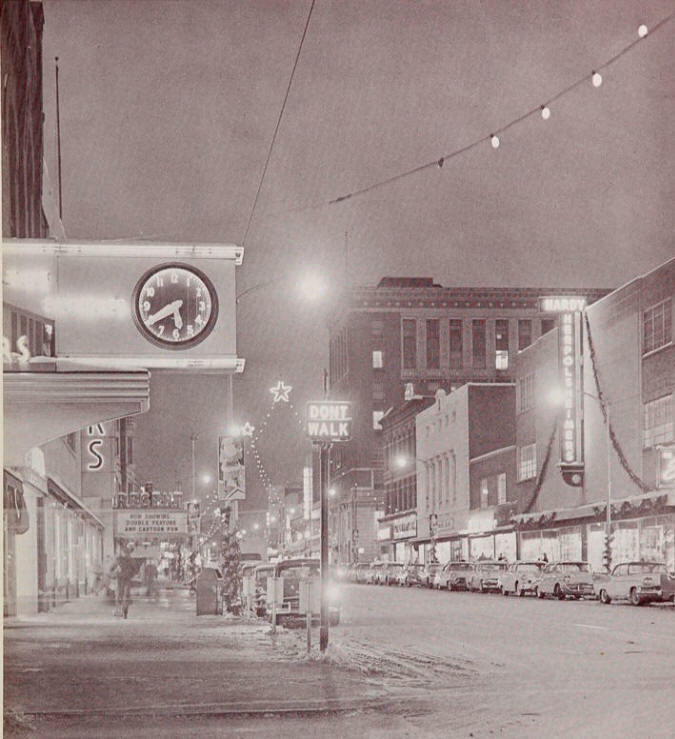 Muskegon's downtown at Christmas, 1959. 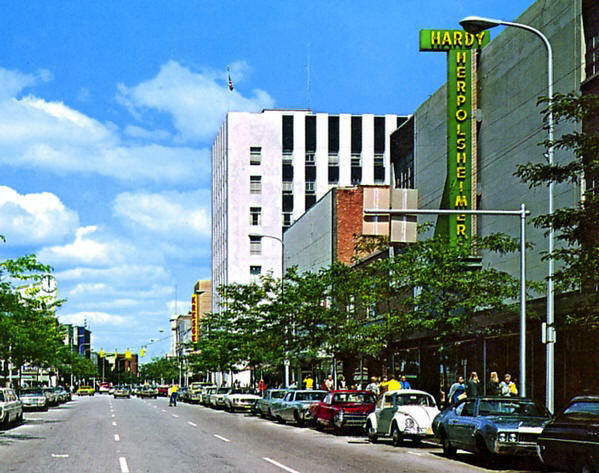 Renamed Hardy-Herpolsheimer following a merger with the Grand Rapids-based department store, Herpolsheimers. 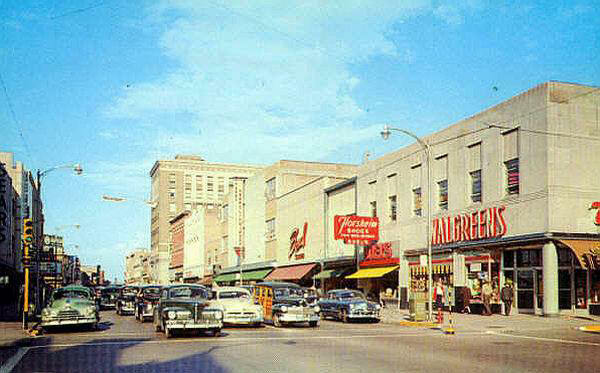 By the late 1950's Walgreens had moved down the block from the corner of Second St. and Western to the corner of First and Western. 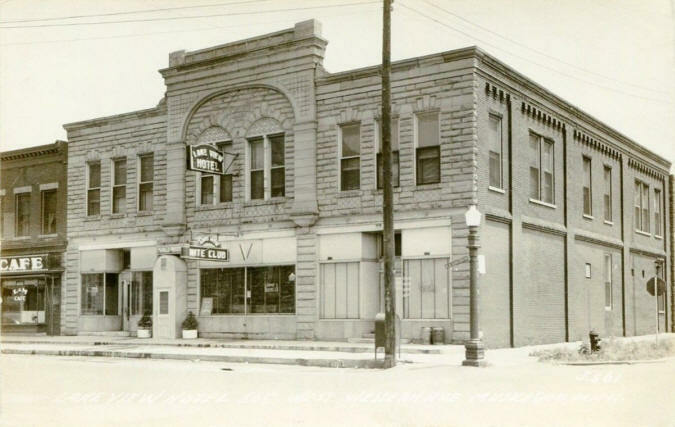 Muskegon Bank of Trust would occupy the former location. 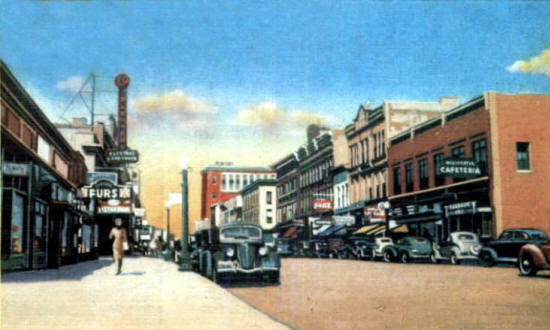 The north side of Western Avenue featured the Lyman Block and the beautiful Regent Theater. 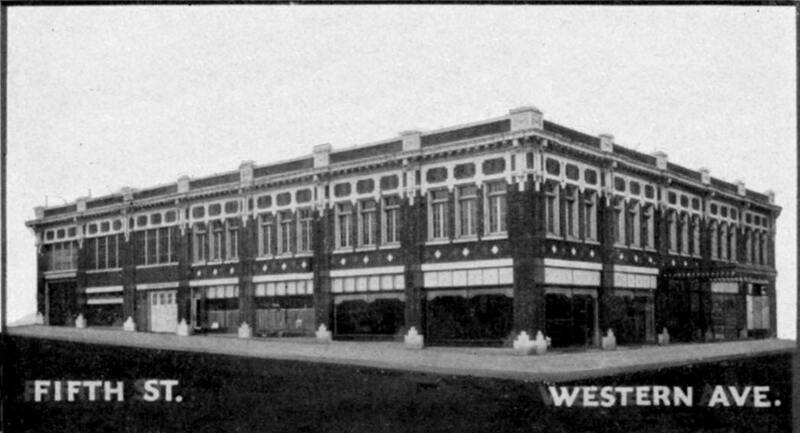 The Masonic Temple, before modifications to the roof line and the building's evolution into the home of Sears. 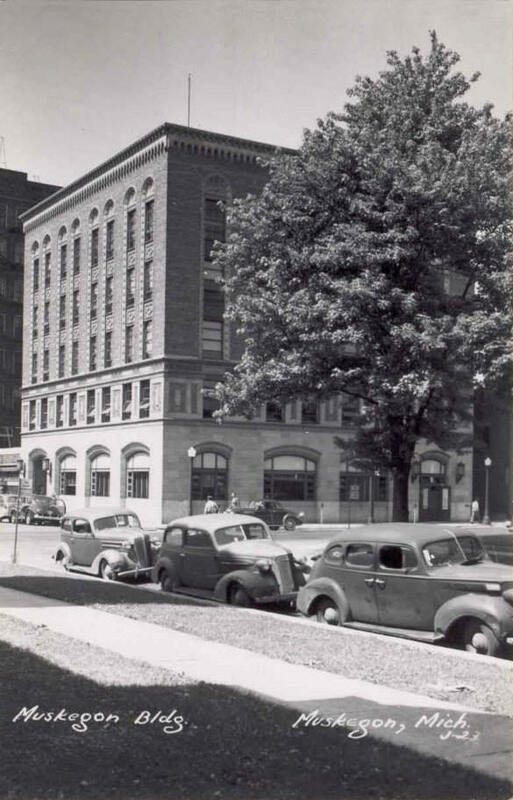 The lodge would move to a new building on Clay in front of Hackley Park in September 1949. 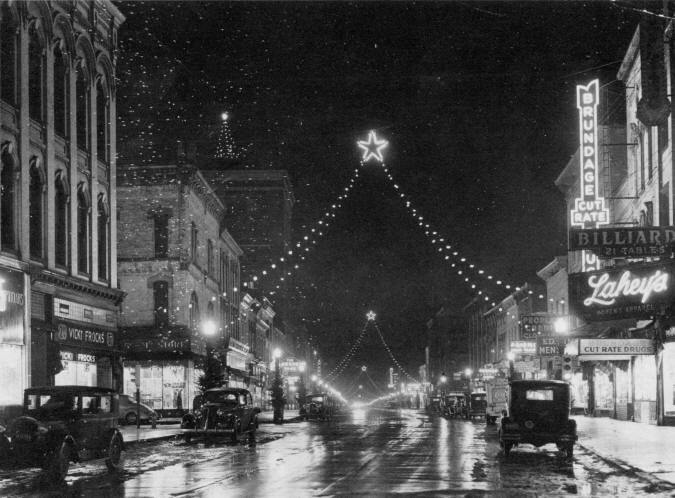 The Lyman Block and Regent Theater from around 1930. 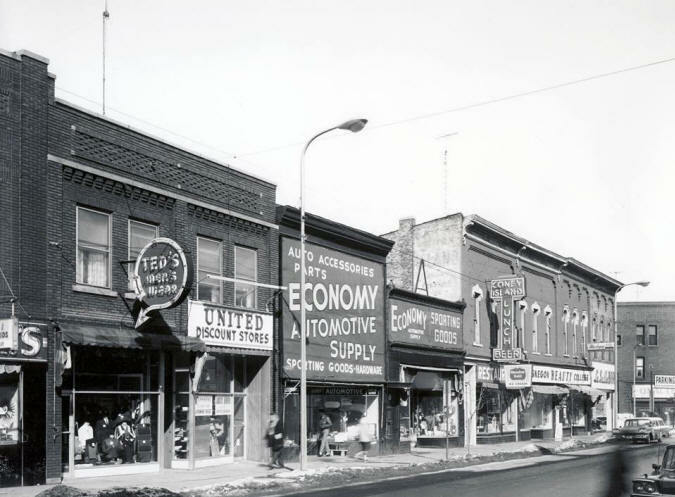 Looking up Western Avenue on the north side of the street during the 1950s. 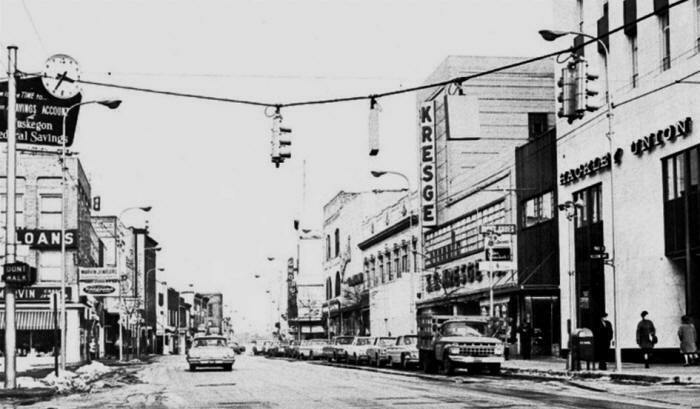 Notice the Lyman Block is now missing its clock tower and the Regent Theater has a new marquee. 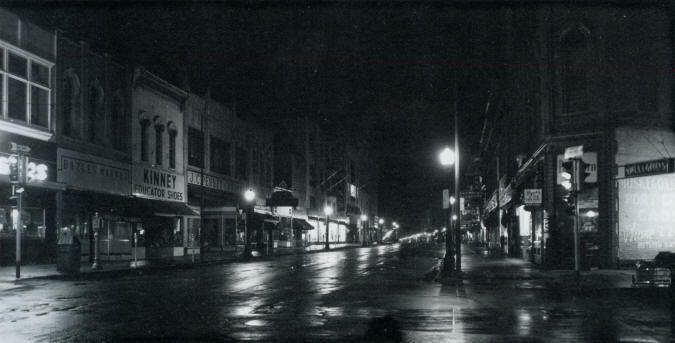 Intersection of First St., Market St. & Western Ave. 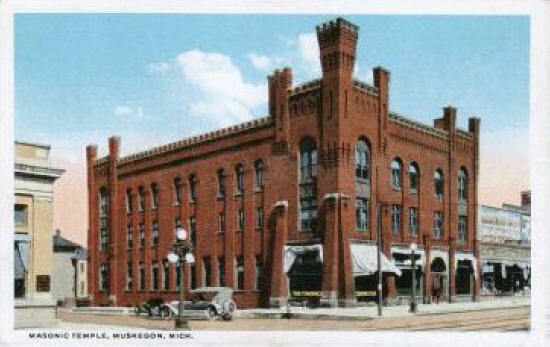 The Muskegon Post Office was established in 1848. 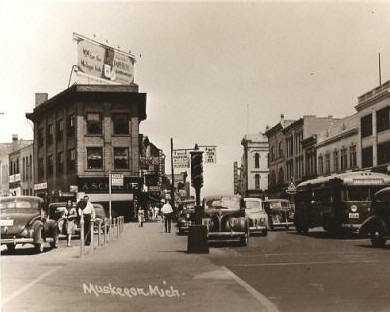 The current building in downtown Muskegon, opened in 1938, was a depression-era Works Progress Administration project. 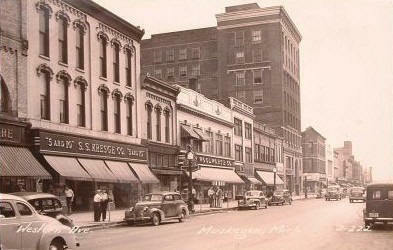 A photo taken that highlights the corner of Western Ave and Market St. 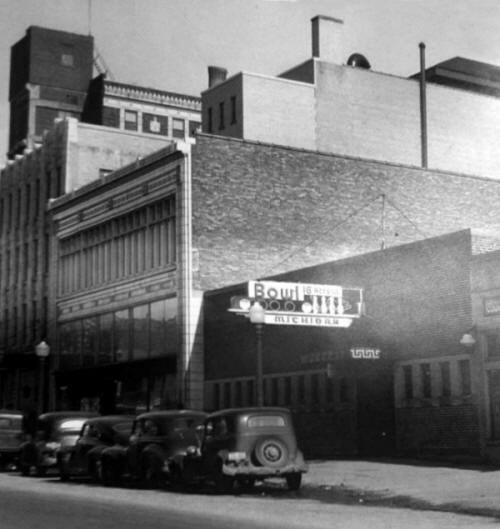 The Ritz Theater would later be known as the N-K. 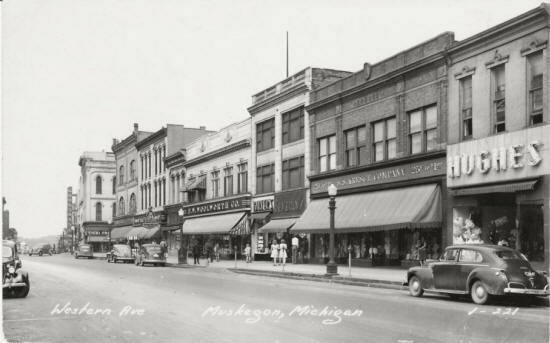 Images of Muskegon's Flatiron Building at the corner of Western and Market. 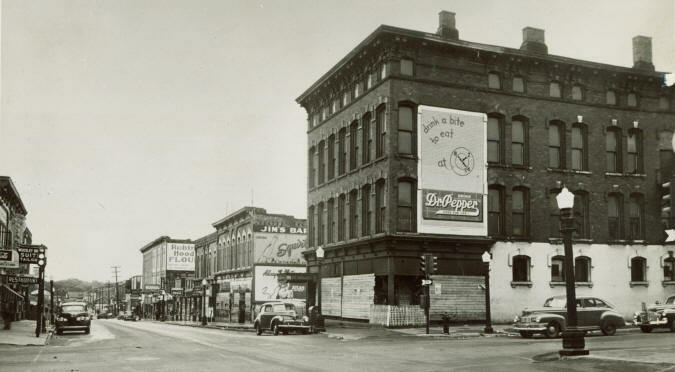 A tobacco shop, A. Schulte, was the occupant of the main strorefront for years. Notice the changing sponsors of the rooftop bilboard over time. This view of Federal Square is from the late 1960s, when Marvin Jewelers occupied the main storefront of the Flatiron Building. from First St. to Jefferson St. Looking Up First St from Western Ave. 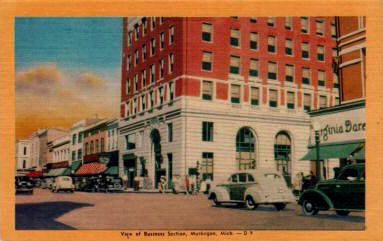 Note the Union National Bank Building to the left. 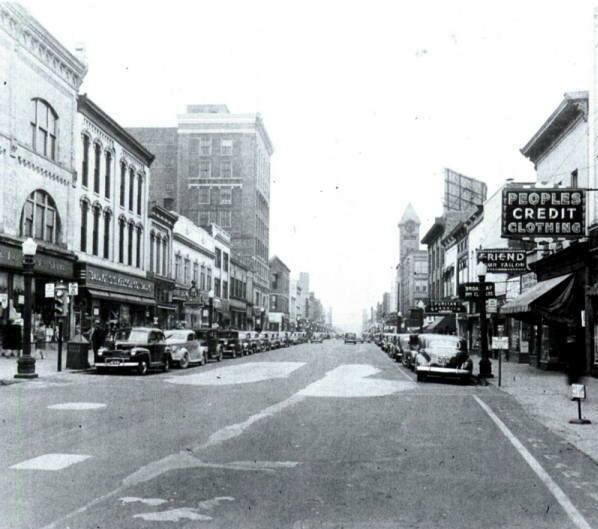 The intersection of First St, Western Ave and Market Street, near the Post Office. Western Ave. looking east beyond the Flatiron Building, toward Jefferson Street. 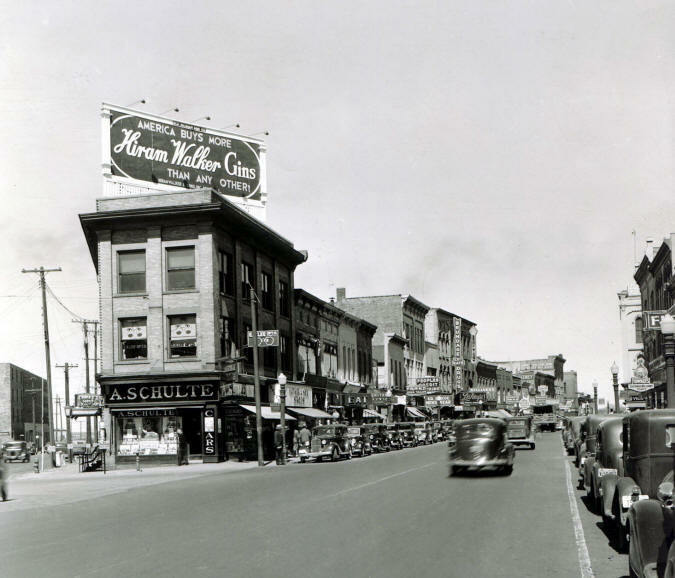 The evolution of Western Avenue between First and Jefferson. A view looking from Jefferson toward First St. In the romanticized postcard view, reality is modified. The sky is beautiful. Sidewalks are cleaned and unnecessary signage and trash cans disappear. Streets are repaved and lines painted to present a more memorable view of the city. Corner of Western Ave. and Jefferson. from Jefferson St. to Terrace St. 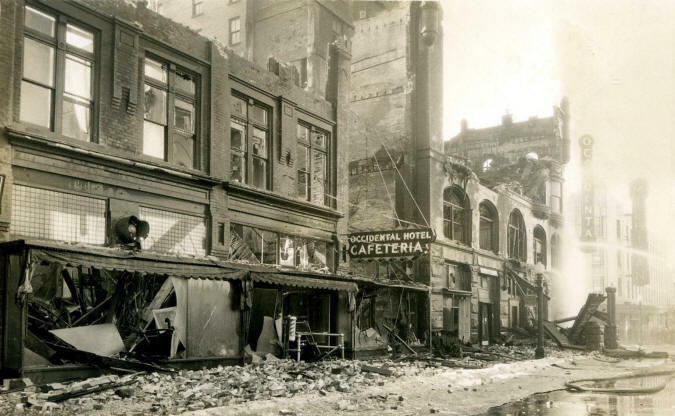 In the early morning of February 6, 1937, a fire started in the basement of Kline's Department Store, and engulfed both Kline's and Grossman's Department stores as no firewall separated the buildings. 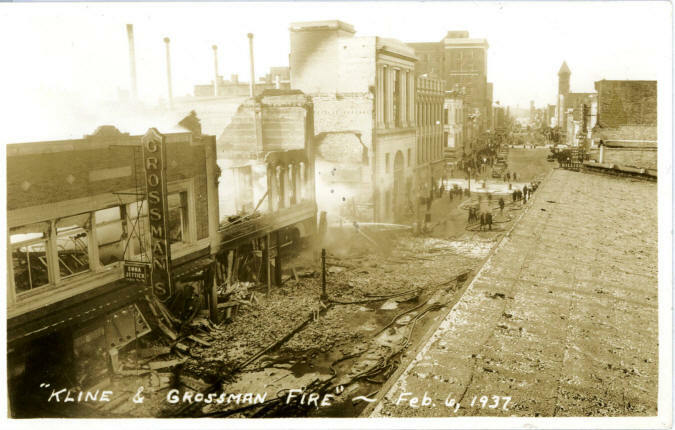 Grossman's rebuilt on the same site. 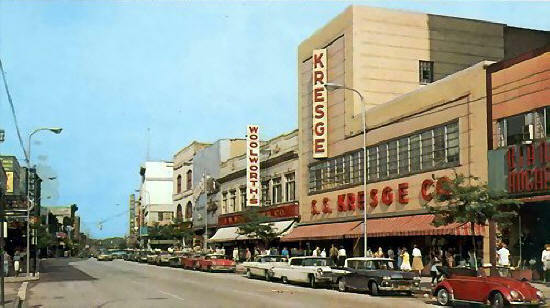 A Federal Department Store would ultimately occupy the Kline site. R & S Shoes Store - 193 W. Western Ave.
Coney Island Lunch - 200 W. Western Ave. 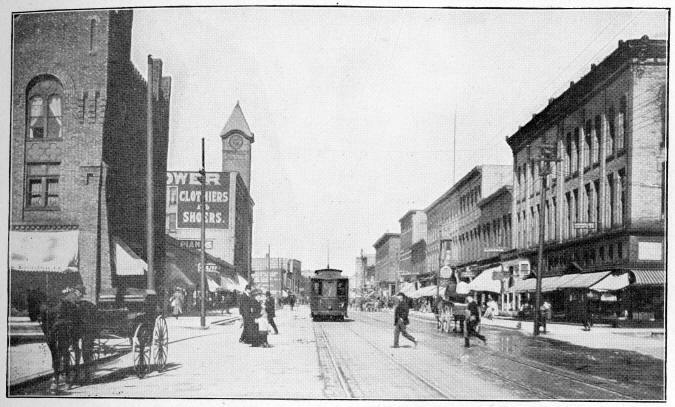 The corner of Terrace and Western, looking toward Pine St. Looking north, up Terrace toward Western Avenue. 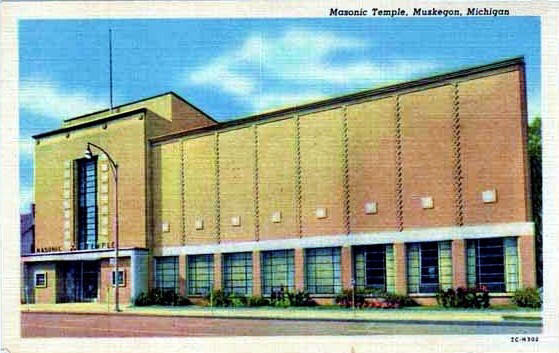 The new Masonic Temple, opened in 1949. 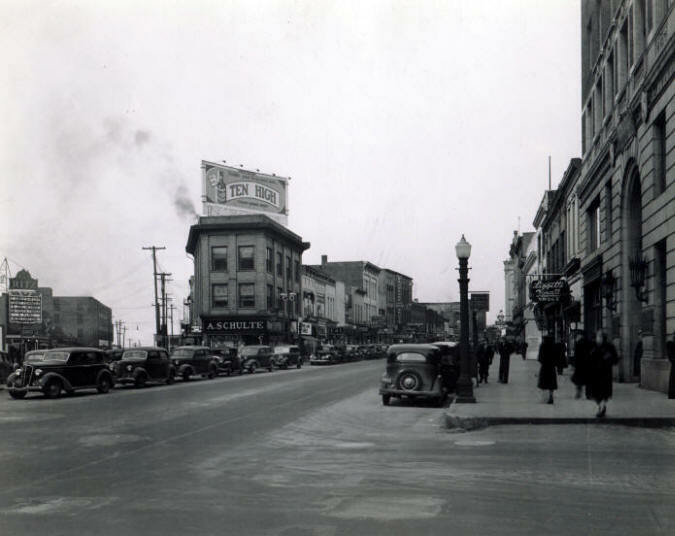 The Muskegon Chronicle building, on the corner of Clay and Third Street, around the time it opened in 1928. 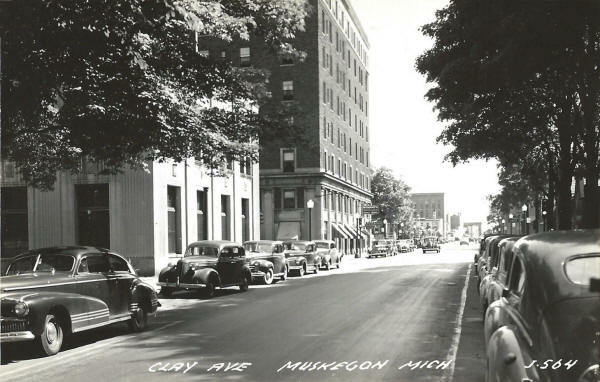 Muskegon Chronicle and Occidental Hotel, looking east down Clay. 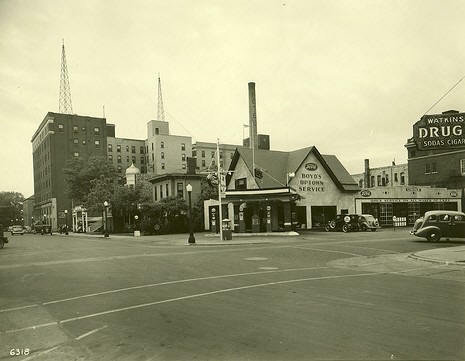 Boyd's Uptown Service catty-corner from the YMCA. Civic leaders and citizens gather in front of the post office in September 1925 to kick off fundraising for the city's first YMCA. (Among the group are members of the Muskegon High School band. Note the drum to the right in the photo). Within a year, the money would be raised and construction would begin. 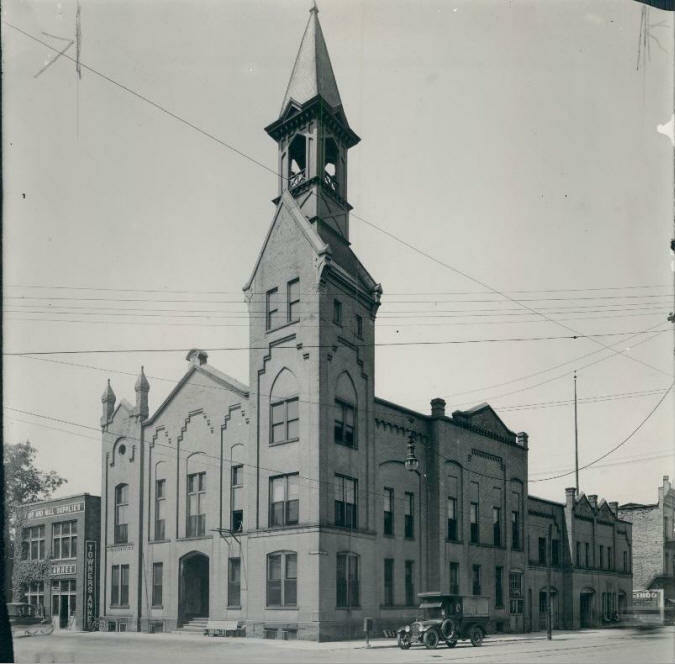 The beautiful structure that they funded - Muskegon's first YMCA - included a gymnasium and swimming pool at Second and Clay. 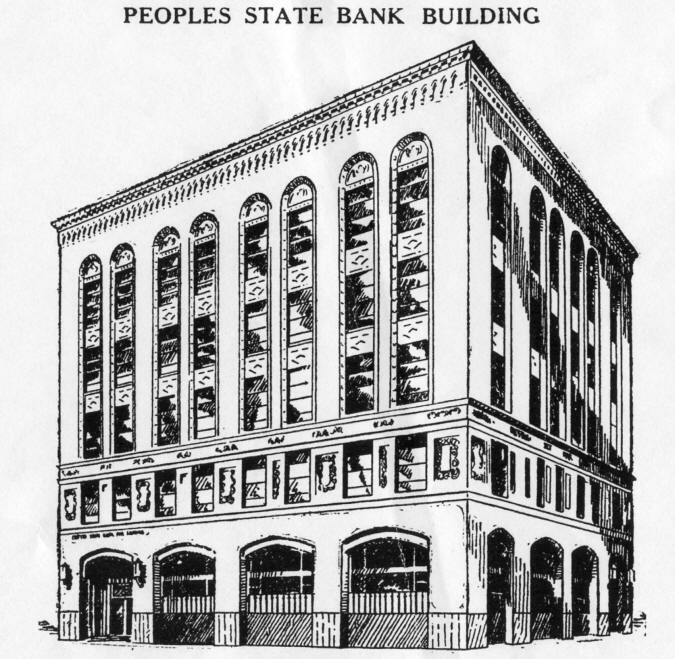 People's State Bank building, above and below, located at the northeast corner of First Street and Clay. Towner Packard, located on Clay between 1st and Jefferson. 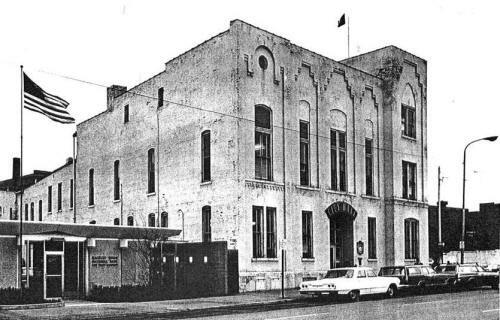 Muskegon's City Hall (above), at the corner of Clay and Jefferson, as it appeared early in the century, and (below) as it appeared in the late 1960s. 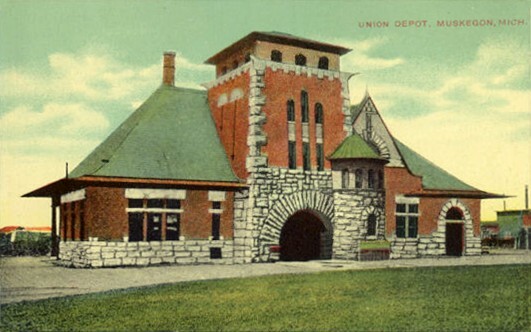 Erected in 1881 at a cost of $25,000, the structure also housed the fire department at the rear of the building at the time it opened. Notice the removal of the bell tower and ornate roof line from the original design in the later images. 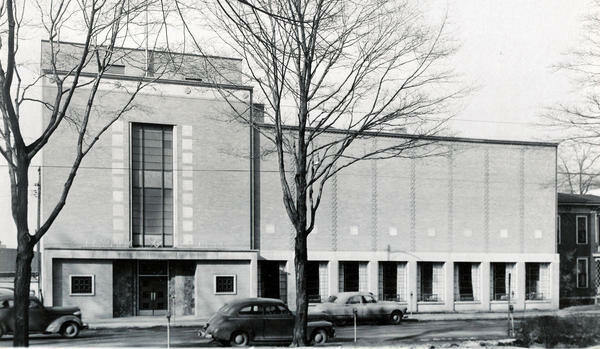 Efforts to replace the building began in the early 1960s and the structure was ultimately demolished and replaced in 1970. 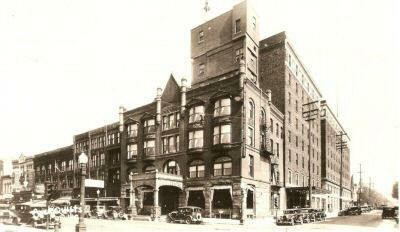 A 1931 shot of the Terminal Arcade Building. 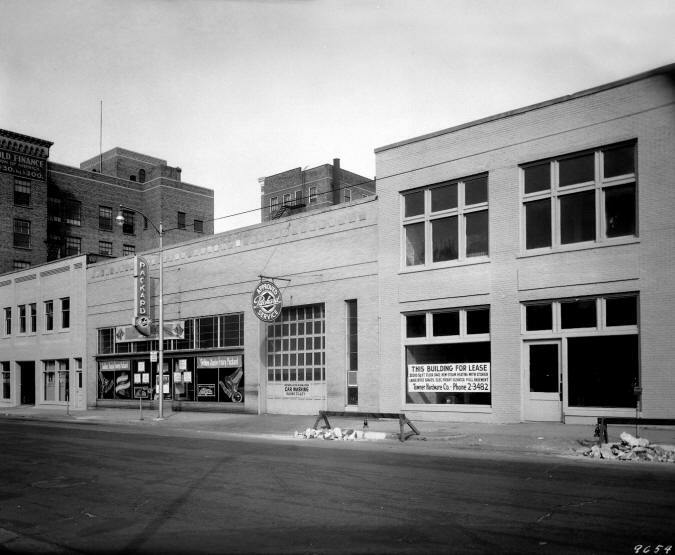 The Terminal Arcade Building at the corner of Clay and Jefferson.